To celebrate the festive season MTS India has come up with an exciting Diwali offer for its CDMA Mobile subscribers in Kerala and Tamil Nadu-Chennai telecom circle. MTS the mobile telephony brand of Sistema Shyam TeleServices Ltd (SSTL) today announced the "Diwali Offer" which give another reason to rejoice with Free Unlimited local calls to stay tune with near and dear. 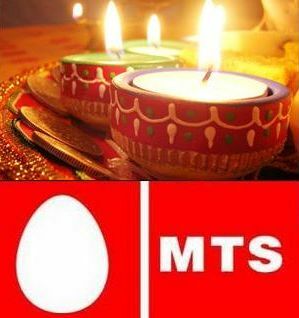 With "MTS Diwali offer" the subscriber can enjoy MTS-to-MTS Unlimited FREE Local calls for one year and on other local networks call will be chargeable at 1 paisa per second. The lifetime validity for comes with this Diwali Pack of Rs.999 and All STD calls at to any network with are charged at 2 paisa per second across India. All Local and National SMS would be charged at 50 paisa per SMS. After the completion of one year from the date of activation (of Diwali offer), local MTS-to-MTS calls will be charged at 1 paisa per 2 seconds. If MTS Subscribers interested in availing free MTS-to-MTS local calls can do so with MSaver74 RCV.